This is a special guest post by an undergraduate student in Samantha Smith’s Spring 2018 “Current Topics and Methods in Environmental Science” course at Thomas More College (Crestview Hills, KY). This course is designed to provide a broad overview of current and ongoing issues in environmental science through discussions and field/laboratory exercises. Students were assigned to write blog posts to strengthen their ability to convey scientific research to a wider audience. I am currently attending Thomas More College to major in Biology and minor in Environmental Science. I hope to then obtain my master’s in Biology or Zoology and pursue a career in animal conservation. My dream job would be to work at the Cincinnati Zoo. In my spare time I enjoy being outdoors, skiing, boating, and spending time with my family. Article: Smolko, Peter, et al. “Seasonal Dynamics of Forage For Red Deer in Temperate Forests: Importance of the Habitat Properties, Stand Development Stage and Overstorey Dynamics.” BioOne, Nordic for Wildlife Research, 2018, www.bioone.org/doi/full/10.2981/wlb.00366. How are Red Deer Impacting the Land? Between the years of 2000 and 2015 the red deer (Cervus elaphus) population increased by 95% in Slovakia. This was the result of commercial hunting that gained popularity throughout the 1990’s in order to win trophies. Usually hunters killed male deer, creating an imbalance between male and female deer and therefore leading to the rapid increase in the population. This increase in red deer population put a strain on forested areas due to the deer’s foraging and resulted in reduced tree growth and timber quality, ultimately impacting the region’s economy. Unfortunately, these losses produced tension between the farmers and foresters being impacted by the deer, and the wildlife managers responsible for keeping them in check. The sudden boom of red deer also threw off the balance of other wildlife and surrounding ecosystems. 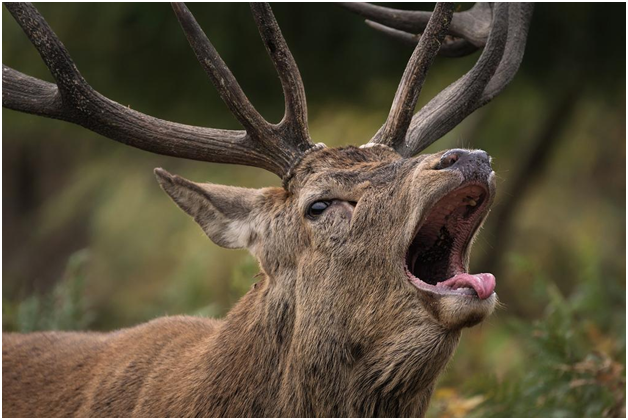 Red deer are often described as “ecosystem engineers,” because at high volumes they cause changes in plant species composition, soil properties, and the carbon cycle, which subsequently affects other organisms such as bird and insects. Just as the deer were destroying the profitability of farms and forests, their foraging was also disrupting the habitat and food sources of these other forest inhabitants. Peter Smolko and colleagues investigated the amount of seasonal forage biomass produced by different types of habitat and explained that the amount of forage available during different seasons determines the boom or bust of red deer. How Do We Estimate Seasonal Biomass? Researchers used data from 320 sampling plots to estimate the overall availability of seasonal forage items consumed by red deer. The study was conducted in temperate forests of the Kremnické Vrchy Mountains in central Slovakia shown in the figure below. Samples were taken of the available vegetation biomass during the summer of 2014 and winter of 2016 by examining 30 random plots from five different habitat types: deciduous, coniferous, and mixed forests, cutblocks, and meadows/pastures. A “cutblock” is an area with defined boundaries that is destined for, or the result of, timber harvesting. Cropland was omitted because is it known to be comparable to pastures, is only a small portion of the land area being studied, and are not important as red deer habitat. The researchers clipped and weighed vegetation that was greater than or equal to 2 meters above ground, since that is within a red deer’s reachable height. Also, trees with a diameter between 5 to 25 centimeters were recorded in order to find the amount of fresh bark biomass, because red deer feed on bark during winter. Researchers analyzed canopy closure and new tree growth on “cutblock areas” to assess available vegetation as well. Additionally, researchers produced seasonal “indexes of forage stocks”, which represented available forage for red deer to consume. Lastly, the researchers ran tests to find the difference between the amounts of forage available during summer versus winter. Researchers found significant variation of available forage between different habitats and seasons. Cutblocks had the highest diversity and available forage. When compared to mature forests, cutblocks produced 11 times more forage biomass in summer and 19 times more in winter! Throughout the winter, average forage biomass decreased by 65% to 98%, so cutblocks provided red deer with large amounts of additional forage to consume. The amount of canopy coverage also played a role in the total amount of forage produced. Dense canopies limit the amount of vegetation that can grow underneath. Summer forage biomass peaked at about 8 years and winter forage biomass at about 10 years, then slowly declined as cutblocks aged and the canopy increased. Altogether, the researchers found that summer seasons supplied red deer with much more available forage, especially in cutblocks. This increased forage availability is beneficial because it can reduce damage caused by red deer elsewhere when they have to roam farther to graze. Ultimately, foresters and farmers of Slovakia suffered from the rapid increase of red deer taking over their land. Through this study, researchers discovered a solution to this red deer takeover. Their results found that cutblocking during the winter seasons could help control the amount of vegetation available and better sustain the red deer population. They also discussed the concept of “hunting for fear.” In other words, this involves driving the deer into different areas for population control. In conclusion, researchers found that the most effective way to control the red deer population and promote forage development, would include the creation of a system that incorporates forestry, agriculture, wildlife and conservation management altogether as one. “Glossary of Forestry Terms in British Columbia.” Ministry of Forests and Range, March 2008. https://www.for.gov.bc.ca/hfd/library/documents/glossary/glossary.pdf. Smolko, Peter, et al. “Seasonal Dynamics of Forage for Red Deer in Temperate Forests: Importance of the Habitat Properties, Stand Development Stage and Overstorey Dynamics.” BioOne, Nordic for Wildlife Research, 2018, www.bioone.org/doi/full/10.2981/wlb.00366.